Synching Safari's bookmarks without dotMac! What I really like about dotMac (or now MobileMe) is how everything gets synched in the background on all my Macs. If you don't subscribe to dotMac however, there are alternatives. A free application called iBackupSafari creates a file that contains all the info about your bookmarks in Safari. What is great is that it is not only useful for backup, you can also use it to transfer bookmarks to a new Mac. Unfortunately, it won't merge bookmarks from two or more Macs like dotMac, but it is still a useful tool (especially when you get a new Mac). Learn more about iBackupSafari or download it here from MacUpdate. I met someone recently who was using active corners to launch Exposé. I thought it was really cool and efficient, until I tried it myself. I kept accidently setting it off. I did, however, discover an additional feature that made these active corners worthwhile: active corners with a modifier. The way it works is that you hold down a modifier (Command, Option, Shift, etc) while setting the active corner. In this case, the only way to activate the active corner is by holding down the modifier while hovering over that corner with the mouse. I know the iPhone and the iPod Touch don't have a lot of storage, but it would still be very useful to use them in disk mode. I found out about this great utility called "DiskAid" that makes it possible to use the iPhone/iPod Touch in disk mode. What is even better about this application is that it runs on your Mac and you don't need a jailbroken iPhone/iPod Touch. It is basically compatible with a standard 1.1.1 to 1.1.4 firmware iPhone/iPod. More info and download link here on MacUpdate. If you take the time to rate all your photos, there is an easy way to sort and display photos in your iPhoto library by rating. To do so, click on the magnifying glass at the left of the search bar in the lower left corner. From there, you can switch it to rating. You can then select to display only photos that are rated a select number of stars or higher. This is a cool freeware that I just discovered and it is great for optimizing your time management. It is called Slife. It basically keeps track of everything you are doing on your Mac. You can then get a really detailed summary of how much time you have spent answering emails, etc. You can also switch at anytime to a "Privacy Mode" that temporarily stops the application from keeping track of what you are doing on your Mac. This is especially useful if you are doing some professional work on your Mac and you want to find ways of improving your workflow. Learn more or download link here on the developer's website. I really like AIR applications because they have the advantages of websites while making them feel a lot more like standalone applications. They are also entirely cross-platform. One that I discovered recently is the Pandora application. It still works like the website, retrieving the music on the website, but what I really like about using it in AIR is that I never accidently close the wrong browser window and stop the music. You can check out Pandora Desktop here or learn more about Pandora in general here. Pandora is an online radio station where you can choose what kind of music you want to listen too. It is entirely free. I often use the audio recording feature in QuickTime Pro, and even though it is very simple, there is a lot to it. One thing that I noticed is that if you create an audio recording, even if you haven't yet clicked "Record", you won't be able to switch to another audio input in System Preferences. After changing the audio input, you'll have to create a new audio recording. There is also a volume level that is automatically at zero. The volume level lets you hook up a pair of headphones and get an idea of what you are actually recording. It happens so many time when you want to connect to another computer that you need to check out your IP address in System Preferences. The iStat menu that I talked about in a previous post can actually make this a lot easier. If you keep the bandwidth info menu (from iStat menu) in your menu bar, you can find out your IP address there, but you can also mouse over it and choose "Copy IP Address". This menu also let me get rid of the VPN menu, because you can connect to a VPN through the iStat menu if you have set it up in System Preferences. I discovered a cool menu bar item that basically adds easily accessible Notes in the menu bar. It is called Scribblet. It is much more convenient than the Notes widget because it can hold a lot more text. The only disadvantage I found is that it asks you to save. That can be rectified by turning on auto-save in the Preferences. Learn more and download link here on MacUpdate. I know a lot of people don't have multi-touch trackpads, but it is a new thing in OS X and I am sure that within months, we'll see more and more multi-touch in Apple products. So this is a tip, but also a warning because it is more useful to know how to avoid mistakenly using this than it is actually useful. This applies to Finder windows that are in icon mode or to the desktop. The way it works is that using the "Pinch" gesture while in the Finder and the mouse is over the desktop will adjust the size of icons. I actually find this somewhat annoying when it happens and I don't notice it until later. I wish there was a way of locking the size of icons (if anyone knows a way, please post about it in the comments). I am not going to go too much into details about compression, but there are two kinds of compression, spatial and temporal compression. Spatial compression compresses using pixels that are exactly the same (or very close) within the same frame. Temporal compression saves space with pixels that don't change (or change very little) from frame to frame. So really, in the QuickTime export settings, it only looks like you can adjust the overall compression, not specifically the temporal compression (apart from adjusting the number of keyframes). There is a temporal compression slider that is hidden in that window though. You can get it by holding down "Option" and mousing over the Quality slider. If you are a Twitter user, reloading the Twitter website happens often throughout the day. An application that makes this so much better is Twitterrific. It sells for $14.95, but if you don't mind seeing an ad every hour, you can get it for FREE. What is great about it is that it doesn't add any icon in the Dock or in the Command-Tab dialog. It can even automatically update your iChat, Adium or Skype status when you post a tweet. More info here on the developer's website. Adjusting the size of coverflow with multi-touch! I complained about how coverflow is implemented in the Finder when 10.5 came out, but I finally found a way of quickly adjusting its size. It is specifically for newer portables that have multi-touch trackpads. The way it works is by using pinching to change the size of the coverflow section. It can really speed up browsing through Finder windows. The way this tip work might be similar to the one I posted yesterday, but it is so neat. I know there are features in Safari's menus and a keyboard shortcut to do so, but it is so great to do it this way. To email a url that is loaded in Safari with Mail, you simply have to drag the small icon at the left of the url and while holding on to it, pressing "Command-Tab" and dropping the url on Mail. Mail will automatically create a new email with the url. Much like the star bookmarking in Firefox 3, there is a quick way of bookmarking in Safari. You simply have to drag the small icon that is at the left of the url in the address bar and release it over the bookmark bar. It will actually create the bookmark exactly where you dragged it. Unlike Firefox, it will request a name for the bookmark. Zooming in and out in Photoshop! This might be an easy tip for pro designers, but I think it is worth mentioning. 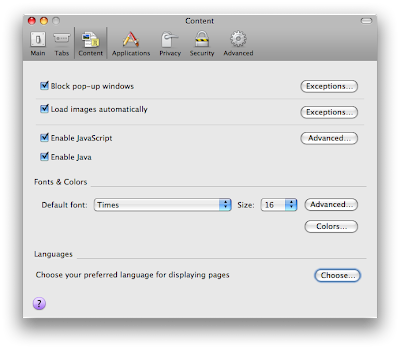 There is the standard shortcut for zooming in and out and that is "Command -" or "Command +". There is a much quicker and more precise way using the mouse scroll wheel. The shortcut is "Option" and the scroll wheel. In Pages, you cannot access multiple tabs in the Inspector at the same time. There is a way to go around this and open multiple Inspectors however. 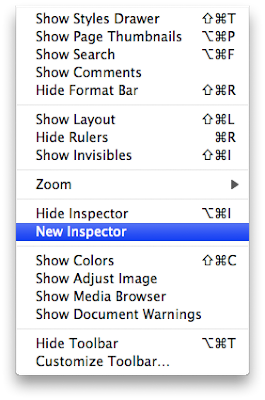 To do so, you simply have to go to the View menu and choose the "New Inspector" feature. Exporting as m4v from Handbrake! There is a preference in Handbrake preferences that lets you encode videos as M4V instead of MP4. It is basically the same encoding, but with a different extension. What happens is that M4V files automatically load in iTunes when you double-click on them. 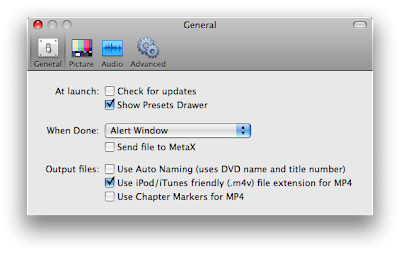 Handbrake says M4V fils are "iPod/iTunes friendly". 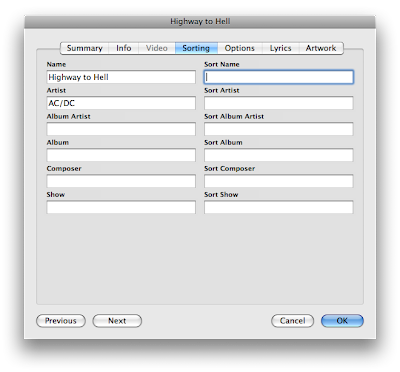 It is also the same file format used for videos sold on the iTunes store. Sorry about the late tip. I had a crazy day yesterday and I didn't even realize I hadn't posted a tip. I often create documents in Apple Pages and one thing that I find annoying is that it automatically changes email and web addresses to hyperlinks. I don't really like the way it looks and most documents I create in Pages are not for the Web anyway. I use to simply disable them in the Inspector in the Hyperlinks tab. There is an easier to avoid having it auto replace the addresses to links. Go to Pages, Preferences. 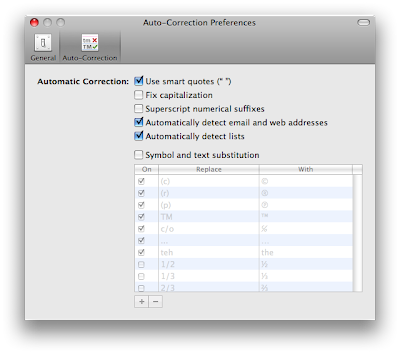 From there, you simply have to disable "Automatically detect email and web addresses" from the Auto-Correction tab. An activity monitor in the menu bar! 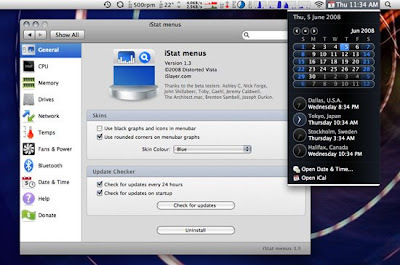 I have to say that in terms of easy access activity monitor, iStat Pro was enough for me. That was until I tried iStat menus. The interface is entirely customizable in System Preferences and you always get a quick preview without having to launch the dashboard. Another great thing is the Date & Time menu. You can even load iCal from the Date & Time menu. More info and download link here on the developer's website. For some people, this might not be a tip at all, but I received a lot of emails concerning keyboard shortcuts. Instead of recreating a list of all the keyboard shortcuts on the Mac, I thought I would just link to the one made by Apple. I looked through it quickly and it is pretty complete. Check it out here on Apple's website. Firefox 3 adds a much quicker way of bookmarking with the star at the end of the URL bar. What is great is that it doesn't even ask for any info such as the website name, etc. It simply assumes that the default info is okay. Of course, it might not always be the best to have this kind of bookmarks, but for short term quick bookmarks, it is an easy way. If you are wondering where you can find these quick bookmarks because there are not in the bookmark bar or menu, check in the Unsorted bookmarks folder. You can access it by going to the "Bookmarks" menu and choosing "Organize Bookmarks..."
This tip is especially useful if you are used to how iPhoto works and you are now using Aperture. In iPhoto, you can just drag a photo out of the application directly to the Finder. With Aperture, the exported photo won't have full resolution. The only way I found to have a full resolution Jpeg out of Aperture is to use the Export menu. From there, you can choose the resolution of the export. If anyone knows of a way to export directly by dragging the file out of Aperture and getting a full res export, please post about it in the comments. I like Preview a lot because it is just so much faster to use than any other image editing app like Pixelmator or Photoshop. Of course, with Leopard, I use it a lot less because of QuickLook. If you are looking for something that has more features or if you are still using Tiger and don't have QuickLook, JustLooking can be a good alternative. A great feature it has is that it lets you browse through other pictures that are in same folder. More info and download link here on MacUpdate. Background to layer in Photoshop! This is a pro tip about Photoshop CS3. If you want to add transparency to a photo in Photoshop, you need to get rid of the background and transform it into a layer. You can quickly do so by holding down "Option" and double-clicking on the "Background" title. The shortcut "Command - W" lets you quickly close a Finder window. 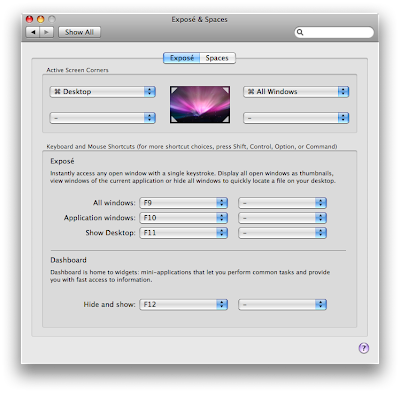 It is also possible to add "Option" and it will close all currently open Finder windows. The same is also true in other applications, but the shortcut varies. I believe this is only part of the Leopard version of TextEdit. 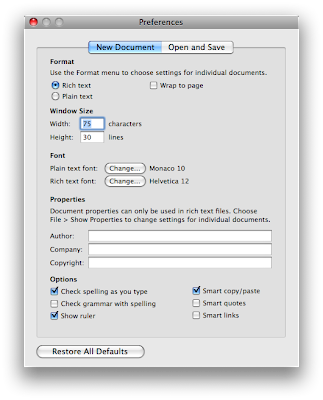 By default, TextEdit checks spelling, but it can also check the grammar. 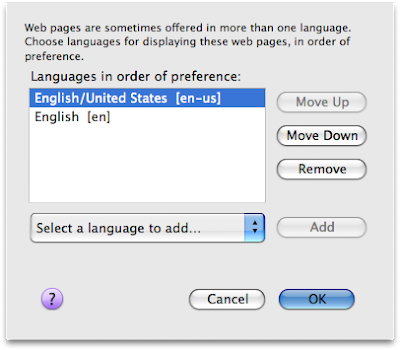 You can enable it in the TextEdit preferences. Once enabled, it will check grammar as you type.